Alexej von Jawlensky, Wiesbaden, a gift from the artist in September 1926, and thence by descent. Anonymous sale, Sotheby's, New York, 13 November 1985, lot 68. J. Helfenstein, 'Die kostbarsten und persönlichsten Geschenke - Der Bildertausch zwischen Feininger, Jawlensky, Kandinsky und Klee', in exh. cat. Die Blaue Vier. Feininger, Jawlensky, Kandinsky, Klee in der Neuen Welt, Bern, Kunstmuseum, 1997 (illustrated p. 96). The Paul Klee Foundation (ed. ), Paul Klee, Catalogue raisonné, vol. 4, 1923-1926, Berne, 2000, no. 3811 (illustrated p. 353). Braunschweig, Schlossmuseum, Paul Klee, January - February 1926. Zürich, Kunsthaus, Ausstellung Paul Klee, Paul Altherr, R. Th. Bosshard, Emil Bressler, Willy F. Burger, Max Burgmeister, Eugen Maurer, August Speck, April - May 1926. no. 29. Wiesbaden, Neues Museum, August-Ausstellung, August 1926, no. 22. Mainz, Stadthalle, Moderne Malerei aus Mainzer Familienbesitz, July - August 1927, no. 156. Villingen-Schwenningen, Beethovenhaus, Paul Klee, 1879-1940, Gemälde, Aquarelle, Zeichnungen, May - June 1973, no. 9 (illustrated p. 25). New York, Leonard Hutton Galleries, The Blue Four - Feininger, Jawlensky, Kandinsky, Paul Klee, 1984, no. 60 (illustrated p. 71). In the mid-1920s, of all the Blue Four artists, it was probably Klee and Jawlensky who maintained the closest contact, a relationship that is attested to by their regular exchange of works of art. The exchange of pictures amongst Klee, Jawlensky, Kandinsky and Feininger was a gesture of mutual esteem and friendship, a sign of artistic and human interest. As one of the first paintings that Jawlensky chose to ask from Klee, Kleine Landschaft mit der Dorfkirche occupies a distinguished place in the history of the Blue Four. In April 1925, Paul and Lily Klee travelled by car to Hildesheim to see an exhibition of works by Alexej and Andreas Jawlensky (Lily Klee, letter to Galka Scheyer, 11 November 1925). Jawlensky then stayed with the Klees in May on his way back from Dresden, a meeting which may have initiated the first exchange of pictures between the two artists. In fact it was probably Jawlensky who made the first approach, to which Klee responded in August 1926, asking Jawlensky to suggest pictures to exchange. Jawlensky enthusiastically replied and chose the present work, Kleine Landschaft mit der Dorfkirche. Klee responded within six days, on condition that the painting did not find a buyer at the exhibition in Wiesbaden, and in September 1926 Jawlensky took possession of the present work. In return, in the spring of 1927, Jawlensky sent Klee his Abstrakter Kopf: Morgenlicht, a painting which Klee proudly hung in his music room. Kleine Landschaft mit der Dorfkirche is an exquisite panorama that depicts a small rural village, its church and surrounding landscape from the unique perspective of Klee's fertile imagination. Employing a Cubist-derived structure that mirrors the artist's fascination with Italian hillside towns that appear to climb mountains, Klee traces an abstract, surreal landscape of memory and imagination. Klee frequently traveled in Europe, and often filled sketchbooks with quickly executed drawings, a wealth of remembered detail which was later transformed into watercolours and paintings. 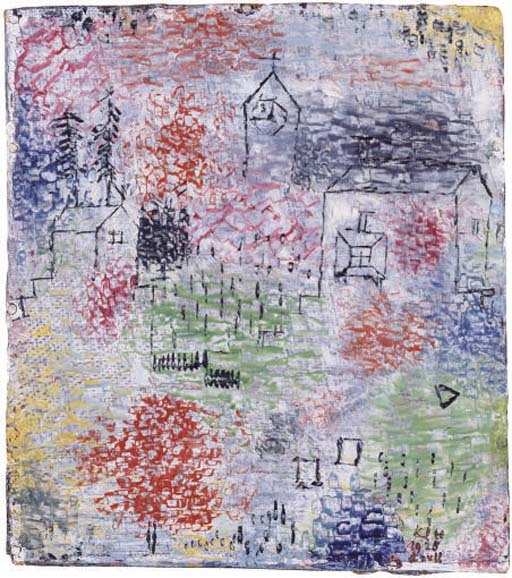 During the mid-1920s Klee introduced a hatched technique, which, at first glance, appears at odds with the underlying cubist structure, but in fact serves to describe simultaneously two aspects of the landscape. Klee renders with firm contours the physical substance of the buildings, while at the same time depicting the fleeting effects of light. Overwriting his architectural landscape with this script-like application of looser brushstrokes, he creates a pattern of hieroglyphs, a pictorial conceit that first appears in Klee's work after his first trip to Tunisia in 1914. Formed by ciphers, symbols, patterns and motifs, this script reiterates Klee's belief that 'symbols reassure the spirit that it need not depend exclusively on terrestrial experience' (ibid., p. 181). Ultimately, form and colour, reality and appearance, the permanent and the transient are merged in a vibrating haze of lines. 'Even in these magical pictures Klee proceeds methodically. Like a musician he sets note next to note, develops, particularizes, deepens, visualizes independently of outer reality, until the final form emerges. In this process one or another of his 'dimensions' comes to the fore - the tonal value or the colour of the rhythm, the harmony of the counterpoint. A pictorial order results which is an analogue of nature. The distribution of color is such that cold hues press from the periphery against warm, bright ones in the center (transition from blue to red through green and brown, from the larger to the smaller form); or the balance between major and minor keys may produce an effect of inner poise... In some of these compositions the sublime lies at a great depth, in others it is contained within the logic of the surface structure' (W. Grohman, Paul Klee, Stuttgart, 1954, p. 215).